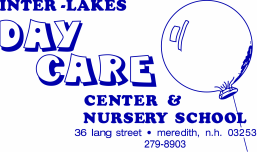 For over 40 years, Inter-Lakes Day Care Center has recognized the importance of a strong curriculum which increases each child's knowledge of the natural world, develops innate curiosity about the world, and broadens thinking skills and problem solving for investigating the world. Within the context of child growth and development, our professionally trained staff maximize the educational experiences for children through developing and implementing innovative curriculum. I-LDCC is a non-profit, licensed, community child care and education agency, which provides exceptional and affordable early care and education to a diverse group of children from six weeks through twelve years of age. I-LDCC promotes comprehensive child development and family support for working parents through infant, toddler, preschool, and school age developmentally appropriate curriculum, engaging children in activities that develop language and literacy through interactions, experiences, and relationships with peers and teachers. I-LDCC supports the well-being of the whole child while providing a warm, nurturing environment.